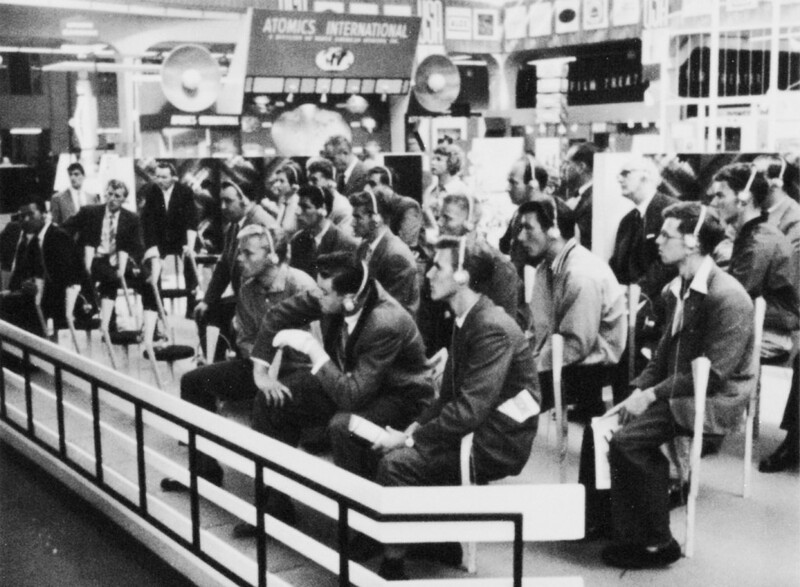 A group of high school students is watching a film shown at the United Kingdom exhibition in the commercial and industrial exhibit. The film, "How a Thermal Reactor Works", is one of many shown daily and transmitted in four different languages. In connection with the Second UN International Conference on the Peaceful Uses of Atomic energy, 13 countries participated in the parallel exhibition. 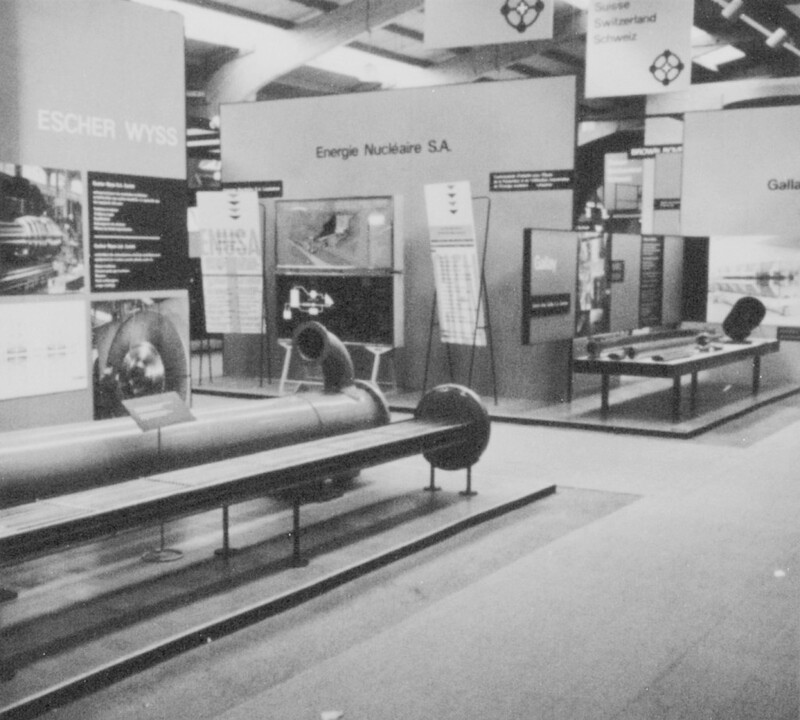 General view of the Swiss exhibit. 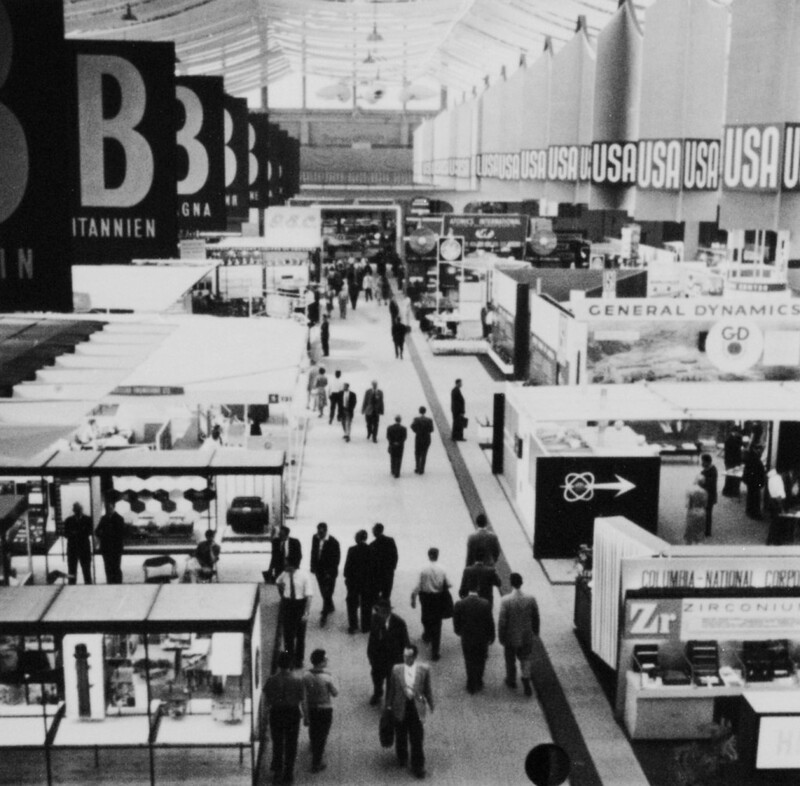 Long before the "Iron Curtain" fell, a conference on the shores of Lake Geneva celebrated the end of classified documents and secret research behind closed doors: From 1-13 September 1958, 5000 scientists, government officials and observers from both East and West had come to the old League of Nations building in Geneva - and the nearby exhibition hall that had been constructed especially for this first nuclear world "fair" - to bear witness to the revelation of nuclear research. Sponsored by the United Nations, the "Second United Nations International Conference on the Peaceful Uses of Atomic Energy", better known as the "Atoms for Peace" conference, was the largest international gathering ever to focus on the potential of taming nuclear energy for peaceful purposes. The main attraction: the promised revelation of secret fusion research by the United States, Great Britain and the Soviet Union, i.e. the talks of the leading fusion scientists Hannes Alfven, Lev Artsimovich, Ludwig Biermann, Peter Thonemann and Edward Teller on "the possibility of controlled fusion. "On the second day of the conference the fusion scientists crowded into the League of Nations assembly hall. This was the moment of reckoning", writes Robin Herman in her book "Fusion - the search for endless energy". "The first day had been spent mostly on formalities. Now, in major speeches, each country's top scientists were set to present the first broad revelation about what they had achieved in fusion." In his report on fusion research in the USSR, keynote speaker Lev Artsimovich, stressed the importance of this new joint international effort : "We must not underestimate the difficulties which will have to be overcome before we learn to master thermonuclear fusion", he said. "A most important factor in ensuring success in these investigations is the continuation and further development of the international cooperation initiated by our conference. The solution [...] will require a maximum concentration of intellectual effort and the mobilization of very appreciable material facilities and complex apparatus." And Edward Teller, his colleague from the other side of the world, later added: "It is remarkable how closely parallel the developments in the different countries are and this, of course, is due to the fact that we all live in the same world and obey the same laws of nature. [...] It is wonderful that over a large and important area of research we can now all talk and work together freely. I hope that this spirit of cooperation will endure, that it will be generally exercised throughout the world in this field and that be extended also to other fields." Click here to read the "Proceedings of the Second United International Conference on Peaceful Uses of Atomic Energy".